Line a baking sheet with non-stick parchment paper and draw a circle 7 inches in diameter. Put the egg whites in a bowl and beat until very stiff and dry. Beat in half the sugar, then continue beating until the mixture is stiff and shiny. Mix the remaining sugar with the cornstarch and fold into the mixture with the vanilla and vinegar. Spread the meringue on the circle and build up into a bowl-shaped shell, swirling the meringue around the outside of the shell. Bake for up to 1 ½ hours or until crisp and delicately colored. Remove from the oven, leave to cool, then peel off the parchment paper. 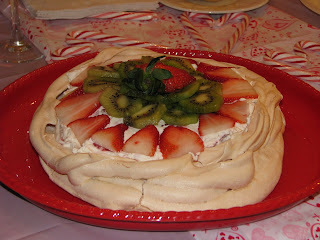 Fold the fruit into the whipped cream and pile into the center of the meringue, arranging the kiwis and strawberries on top.